We've taken a classic potato side dish and added extra flavour with leeks and ham. These scalloped potatoes are creamy, cheesy and baked to perfection. SLICE each leek horizontally, almost to the core; wash thoroughly. Place in large pot with potatoes; cover with water & simmer until potatoes & leeks are tender, about 15 minutes; drain. PLACE potato slices on bottom of greased 13 x 9 in (33 x 22 cm) baking dish. 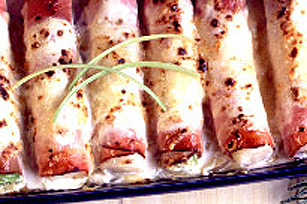 Roll each leek in a ham slice & arrange in single layer over potatoes. HEAT cream cheese & milk in saucepan on medium heat until smooth. Stir in mustard, salt, pepper & 1/2 cup (125 mL) cheese. Heat until cheese is just melted; pour over leeks. BAKE uncovered for 35-40 minutes at 350°F (180°C). Sprinkle remaining cheese over leeks; broil until browned.